Blog - How to choose a landscape lighting? How to choose a landscape lighting? Creating an outdoor lighting design for your house and yard might not be at the top of your home improvement to do list but there are practical and aesthetic reasons for doing it, from increasing the security and safety of your property to providing additional curb appeal at night. The first thing you need to consider is your current setup for exterior lighting. Do you have lighting fixtures already installed or the necessary outlets and / or connections for the job at hand? Many newly constructed homes in residential areas are often equipped with outdoor lighting sources on the left and right corners of the house. If you don’t have a basic setup like this, you should hire an electrician to do it. If you have a home with a less conventional architectural features that extend from a standard straight line layout across the front, you might consider installing additional light sources to highlight these areas. Regardless of whether you are lighting your front or backyard, you need to decide what you want to highlight in your design. Is it your landscape, specific trees or shrubs, a fountain or maybe a courtyard area? In most cases, exterior lighting sources are as high as the eaves of houses or higher with the light shining down, but there are always exceptions to this. If you are only interested in lighting something specific like a walkway, you may find that you can accomplish that effectively with ground lighting or a combination of high and low lights for the best results. Your choices for exterior lighting are primarily going to be flood lights, spotlights or path lights and you might want to consider a combination of all three depending on how elaborate you want your lighting scheme to be. Flood lights will cast a wide beam suitable for illuminating a large area but spot lights will disperse a narrower beam of light, usually less than 45 degrees wide. However, one other option could be the path lights. 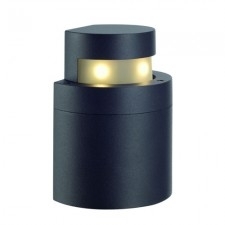 The path lights are most obviously the most effective for lighting walkways and paths. Your next decision will be to choose whether you want to go with LED, halogen or fluorescent lighting. Halogen bulbs produce a higher intensity light that is whiter and brighter than fluorescent. They also use more electricity and emit considerable heat compared to fluorescent lighting which produces very little heat while giving off cool, visible light. Fluorescent lighting is also less inexpensive and more energy efficient than halogen but the bulbs do present a possible health risk if broken because they contain mercury. LED, on the other hand, is quickly becoming the standard favorite because of its performance. Whereas a 50-watt halogen light might have been the most effective choice for a homeowner in the past, a six or seven watt LED light can produce the same effect now. If you are budget conscious, keep in mind that LED is going to cost more than halogen or fluorescent lighting. Another important consideration in exterior lighting design is the correlated color temperature (CCT). This is the color of light produced by the light source and is measured on a temperature scale referred to as Kelvin (K). The higher the Kelvin value of the light source, the closer the light’s color hue will be to actual sunlight. When you are purchasing a bulb, the Kelvin value will be noted on the packaging. For example, if you want the lighting to have a blue hue, look for bulbs in the 4200K range. For an amber hue, choose bulbs with an output of 3500K or lower while a range of 3500-4100K will give you a white hue. For a first time lighting designer, the degree spread of the lamp is important when considering what you want to illuminate. You also want to make sure you purchase fixtures for all external lights so that the light source is hidden or obscured. When creating your lighting configuration, keep in mind that a spotlight has a 15 degree spread, a narrow flood light offers 30-degree coverage and a wide flood light has a 60-degree saturation. If you want to illuminate a garden or path in your yard, you could place the light inside a tree or a trellis facing down over the desired area of focus. This is known as down lighting. Moonlighting is a similar effect that is achieved by placing a large light fixture with a full glare guard high up in a tree and angled toward the ground so that it creates shadow patterns on the ground resembling natural moonlight. Another lighting effect is silhouetting which you accomplish by placing a spotlight behind a feature, creating an illuminated backdrop. This is ideal for displaying the dark outline of a striking specimen plant or topiary or even a sculpture. Test your lighting scheme for any corrections or changes you may need to make, taking into consideration the surroundings of your neighbors. You don’t want to have any lights that are shining or reflecting from other surfaces directly into neighbors' windows. This is a form of light pollution. Make sure you have the appropriate fixtures for your exterior lights. The fixture should have a shield on it to box the light source and prevent people seeing it from the street.